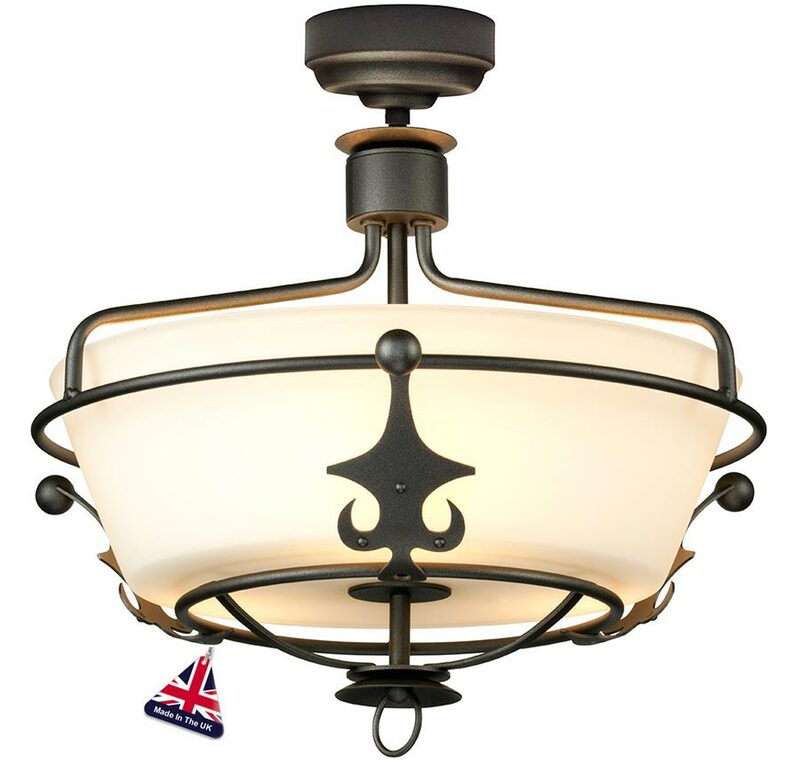 This Elstead Windsor 3 light ironwork semi flush pendant in graphite black finish is made in Britain and boasts a dual mount design. Featuring a ceiling mount, chain link suspension and circular basket frame in graphite black, with etched opal glass shade for a softer light. The detailed frame is decorated with heraldic shields around the rim, lower finial and hanging faceted crystal drops. The Windsor collection is inspired from royal symbols within our English heritage. 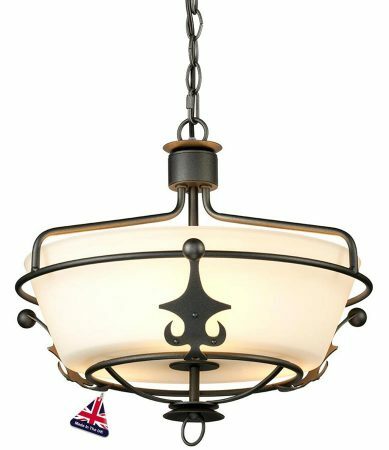 This ceiling light is hand crafted in Elstead Lighting’s UK factory and hand finished in graphite black. An eye-catching focal point and ideal ceiling light for any traditional or period setting that looks wonderful in a hallway, over a dining table, in a bedroom or living room. When fitted flush, this light is just 43cm high making it ideal lighting for rooms with a low ceiling. Supplied with 150cm of chain suspension that can be shortened at the time of installation or can be used without as a semi flush; please see the technical information below for dimensions and secondary image for this light mounted as semi flush. There are matching fittings available in the graphite finish Windsor collection that includes a table lamp, single and three-light wall fittings and four, six and twelve light chandeliers; please see below for the complete range. 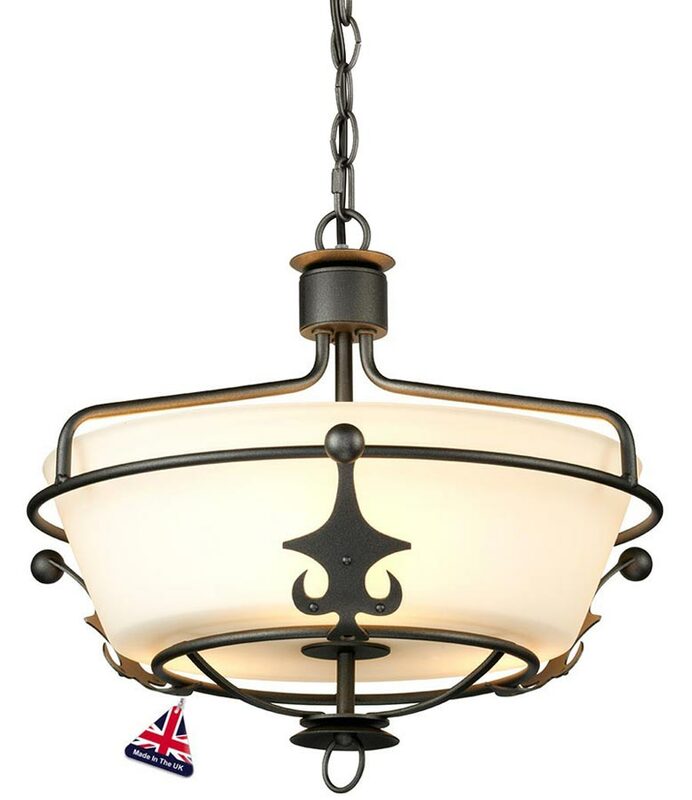 This classic light is supplied by Elstead Lighting, a British company that specialise in the manufacture and distribution of quality decorative lighting such as the Windsor 3 light ironwork semi flush pendant in graphite black finish you see here.